1 Step outside on a summer night. You might see tiny yellow-green lights flashing in the dark. Those little lights are fireflies or lightning bugs. Fireflies are nocturnal insects. This means that they come out at night. 2 Fireflies aren't really flies. 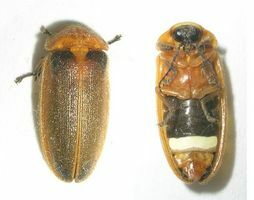 They are beetles. Female fireflies lay their eggs in the ground. When the eggs hatch, the larvae eat worms and slugs. Adult fireflies eat nectar and pollen from plants.